I'm still reeling from BlogHer this year, heck, I'm still reeling from BlogHer last year! One of the most inspirational moments came during the awesome BlogHer '10 Voices of the Year Art Exhibit and Art Auction curated by the fabulous kirtsy chicks, benefitting gulf coast restoration. I first saw the inspiration for painting words on a body through Karen Walrond's photoshoot (Chookoloonks) of Jenny the Bloggess being painted by Katherine Center last year. 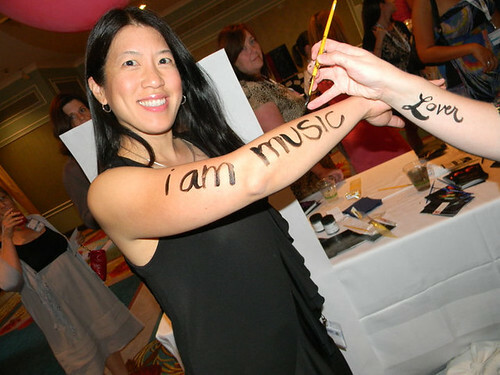 At BlogHer, I was painted by DesignMom and co-founder of kirtsy herself, Gabrielle Blair. Gabby (Lover) painting my arm, photo by Fairly Odd Mother. At first I didn't know what words to use, so Gabby helped by asking what has inspired me recently. I replied that I was starting to take violin lessons. 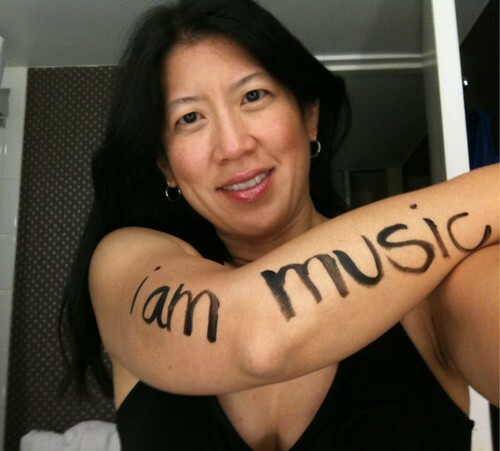 She immediately came up with "i am music" and it fit perfectly. Sure I am a wife, mom, software engineer, and sometimes photographer and writer, but what inspires and energizes me? Where do I turn when I'm happy or sad or frustrated? It is always to music, through playing or listening. Music pours from my body when I'm at the piano. And what's this about learning a new instrument at the age of 43? 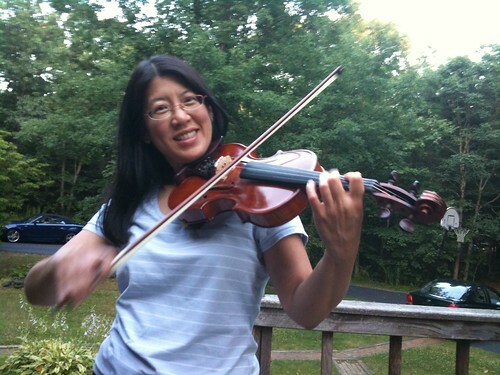 I had taken violin lessons for one summer when I was 13 and hated it. The reason I hated it was probably because I was just a beginner and I was already fairly proficient on the piano (I played Chopin's Revolutionary Etude Op. 10 No. 12 that summer) and flute. Why learn a new instrument from scratch when I already had two under my belt? (I wish I could go back and tell that smug teenager that I should've continued). My violin teacher told me that I was his best student, but I just sloughed him off with my bad attitude. 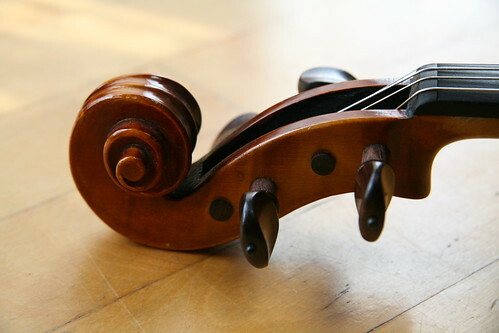 In my twenties, I was convinced that I should play the cello (technically violincello). I loved the idea of wrapping my body around an instrument. I rented a cello and took lessons for about six months. I wanted to become good enough to join a community orchestra. But playing the cello gave me problems with pain and cramps in my hands, so in the end I gave it up. Last year, my friend George decided to take up the fiddle (which is exactly the same as a violin, just different music) even though he had no musical training whatsoever. I picked up his fiddle and played around with some tunes. It was kinda fun. This year, he convinced me over an instant messaging session to take his old fiddle to try out. I was pretty skeptical about having any extra time for it, but I was instantly hooked. 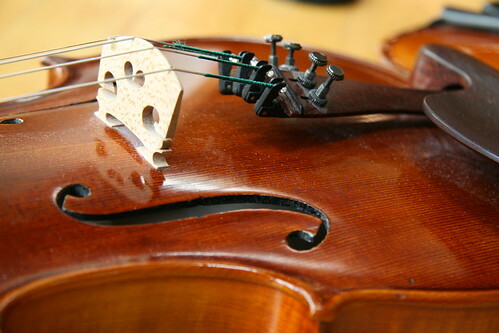 So much so that playing the violin/fiddle dropped my blog posting rate to record low numbers. 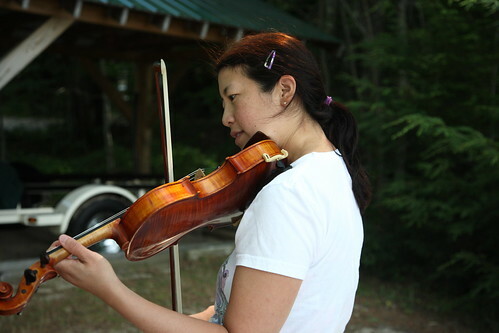 Playing the violin feels completely natural to me, including the bowing. It is like I had played it in a previous life and was always meant to play it. A stupid teenager attitude prevented it all before, but not anymore. Beautiful Canon 5D pic by mswlogo (actually his wife). I'm still clearly a beginner and may never be any good, learning at this age (just ask Doug with his earplugs and wincing). But those moments of "wow, that almost sounded like real music" are well worth it. I've even recorded piano accompaniments for my violin playing. 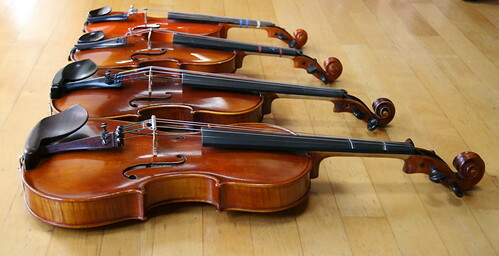 And now the violins are multiplying. We are planning to start lessons for both kids and have rented or borrowed three more violins. From front to back, my full size violin (yes I bought it), Adam's 1/2 size, Dova's 1/4 size in a year or two, and Dova's 1/8 size which she will be starting on. 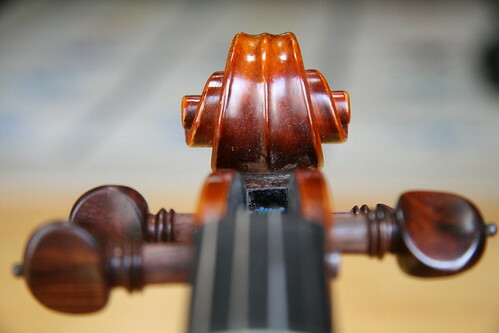 And the violin provides many awesome photography opportunities. I didn't know you were learning to play the violin! That's so great that you're doing it together as a family. It was great to see you again at BlogHer in NY. Hope to see you next year in San Diego. Keep on learning violin and time, do not quit in the middle. I like litsen your piano playing the best. That is one nice looking Violin.